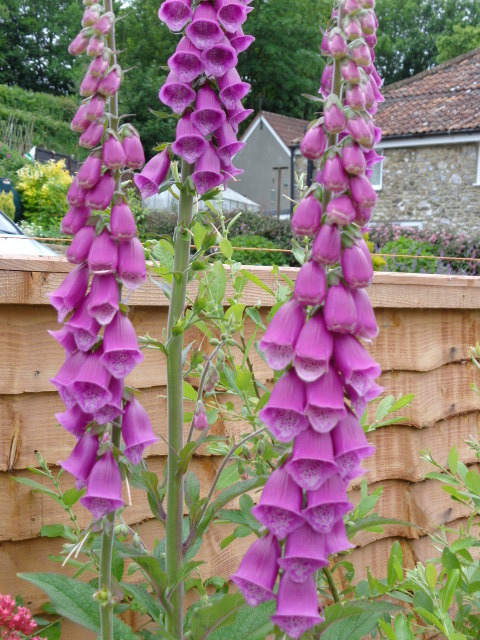 In our back border have sprung up some lovely purple Foxgloves. 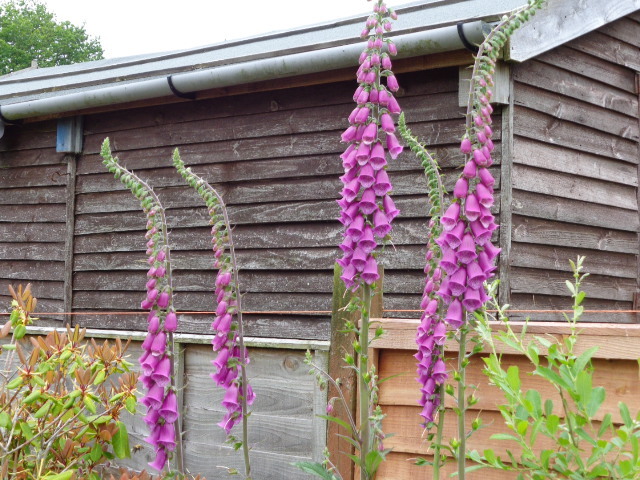 They look fabulous towering over the fence. I shall sprinkle the seeds later on and hopefully we will get some more next year. I just love them!! 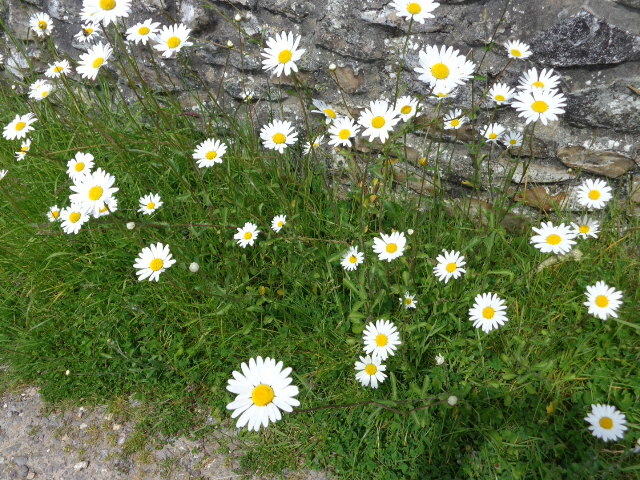 The Leucanthemum vulgare or Ox-Eye Daisy as it is commonly called is growing profusely outside our house. I love this perennial wildflower that grows among grass. 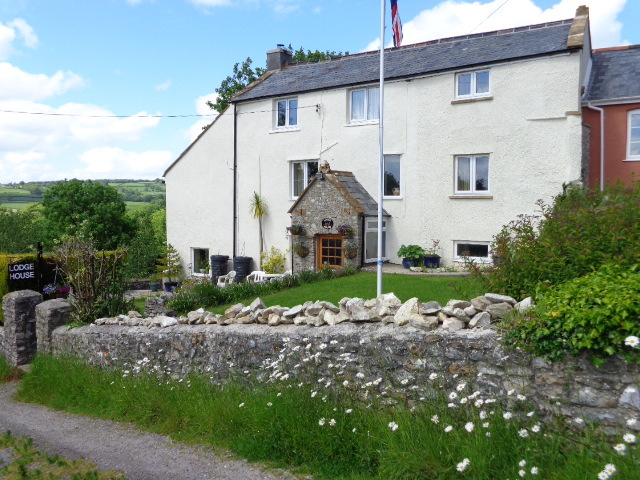 The sunny little flower heads bob in the wind and make the outside of the house attractive. The hedgerows are continually changing with the wild flowers. Now the Bluebells have died down we have Cow Parsley, Campian and these Ox-Eye Daisies. 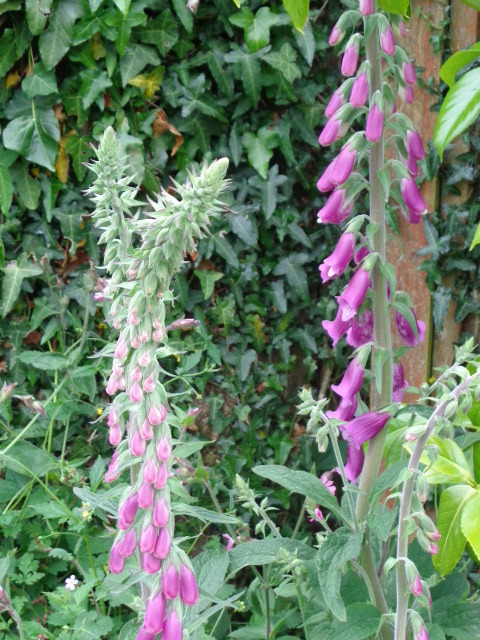 Next will come the Foxgloves and purple Willowherb. Always something to look forward to. Yesterday a friend, whom we’d not seem for a few years, came to visit us. It was lovely to see her again, and we were lucky in that the sun shone, even though the wind was cold. 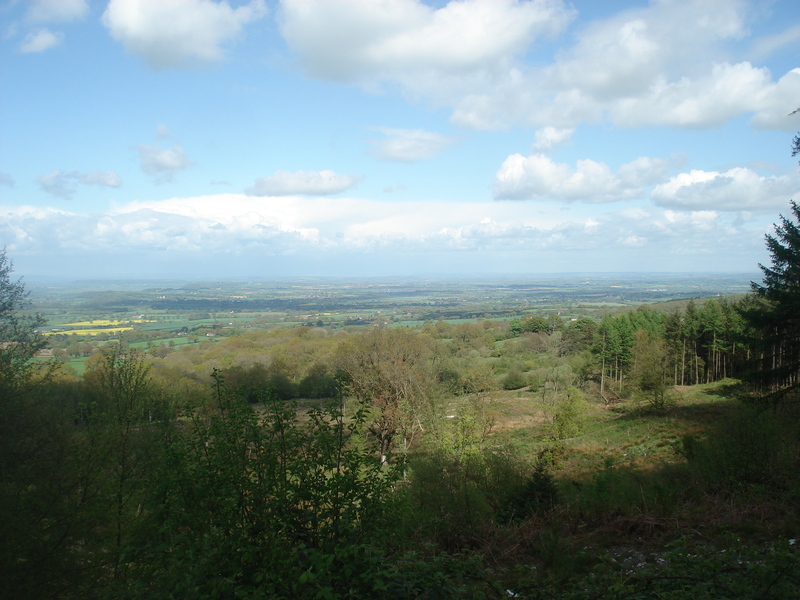 After lunch we took her up to Staple Hill, which is one of my 2 favourite places nearby to go for a walk. 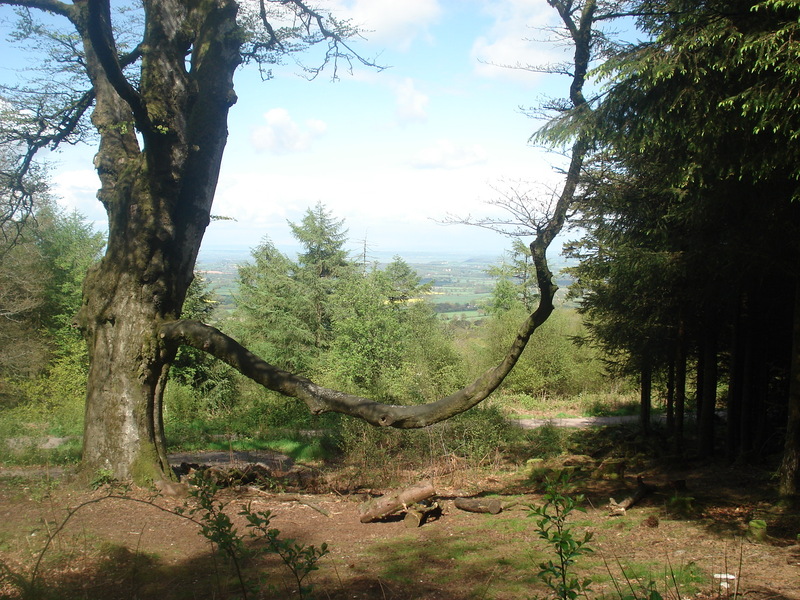 Staple Hill is one of the highest places in the Blackdown Hills, Somerset, England and on a fine day it is said you can see right over to Wales. From there we got back in the car and headed the short distance to Otterhead Lakes at Otterford. 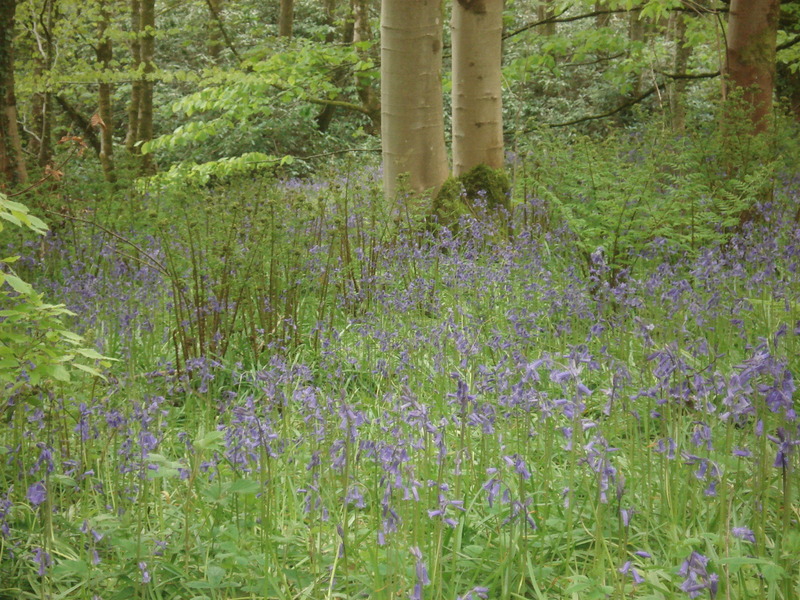 At this time of year the bluebells are out in force and there are carpets of blue in the woods. 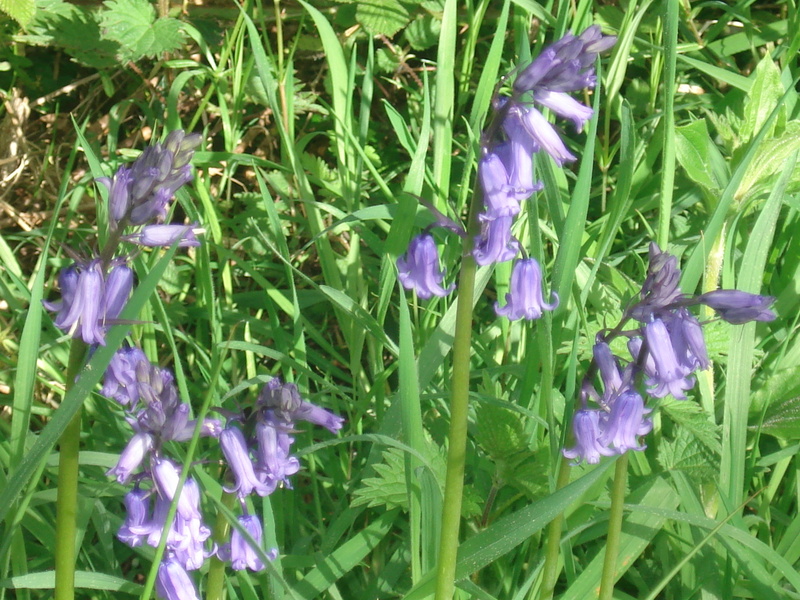 English native bluebells have flowers on one side only and droop to the side. Unfortunately there has been an influx of spanish bluebells in garden centres and these have flowers all the way round. 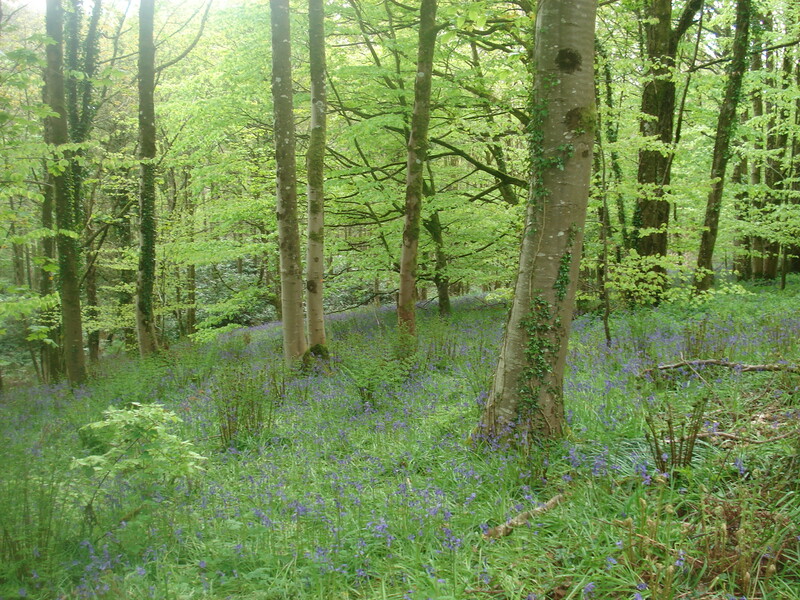 Luckily in established woodland the bluebells are all native English ones. 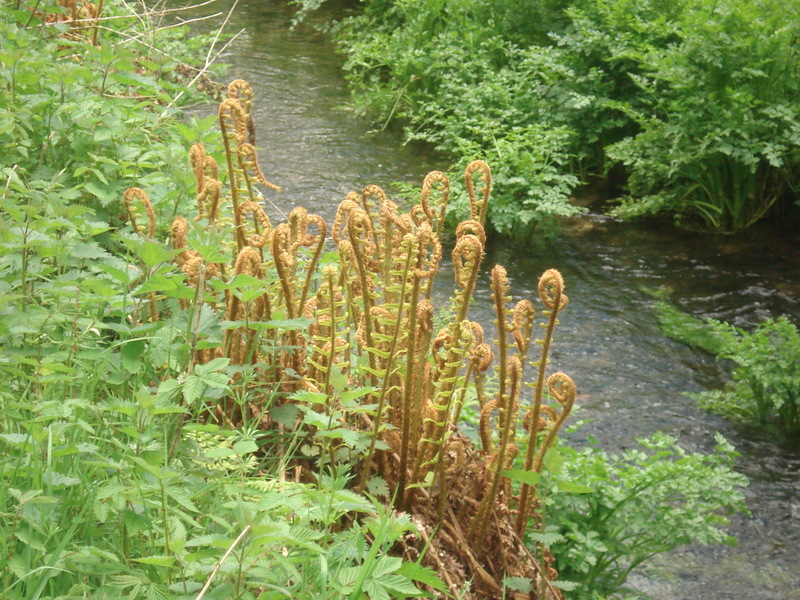 We also spotted some wild garlic with pretty little white flowers and lots of ferns growing up poised ready to unfurl as these ones below. 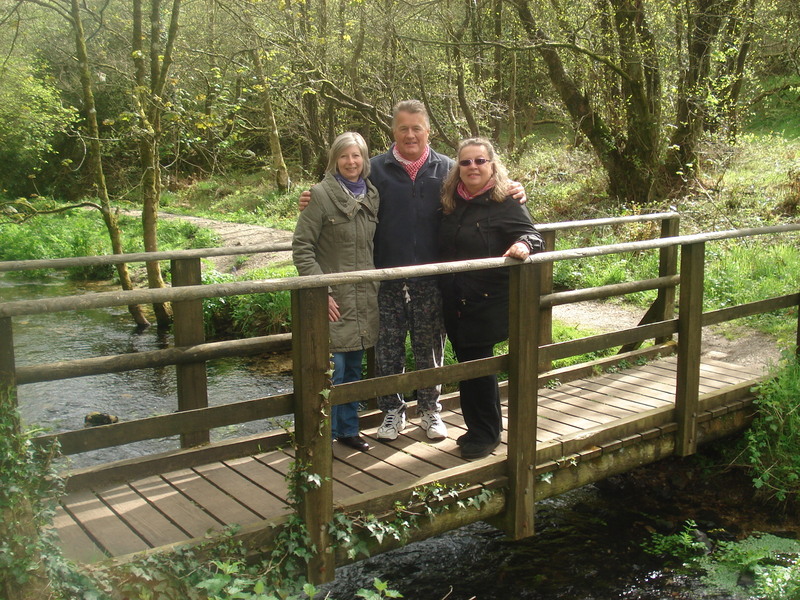 It’s a lovely walk down to the first lake, then along a footpath by the side of a stream, across a footbridge and then eventually the path comes out by the second lake. We met a couple of guys walking their dogs and they took a photo of all 3 of us on the footbridge. You can see we are well wrapped up as it was quite chilly yesterday, but it is a lovely spot for a walk, really beautiful with all those bluebells. We’ve had an invasion in the paddock. 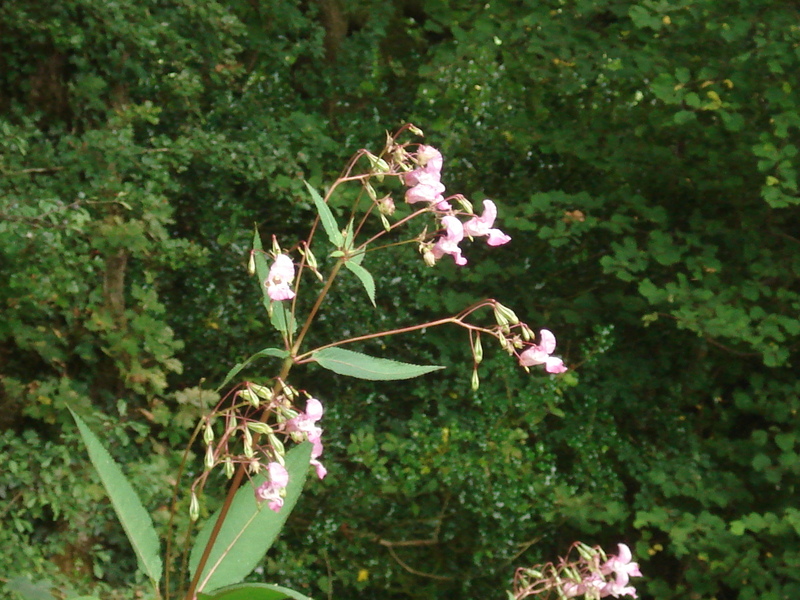 An invasion of Himalyan Balsam plant, which grows tall, over 6 feet tall, and has a pretty pink flower. The bees love it as they are drawn to the sweet nectar. So we let them have their fill of it. However, it is a weed, not just a weed but a viscous thug of a weed. It spreads and will take over a patch of land. When the flowers go to seed, the seed pods burst and spread the seeds up to 7 metres or 21 feet, so the following year encroaching on more land. Himalyan Balsam is said to be as much of a nuisance as Japanese Knotweed and needs to be destroyed. So one afternoon this week, Neil and I went down to the bottom of the paddock and pulled up all the Himalyan Balsam (it is quite shallow rooted) and put on a bonfire. The next day Neil set light to it all. 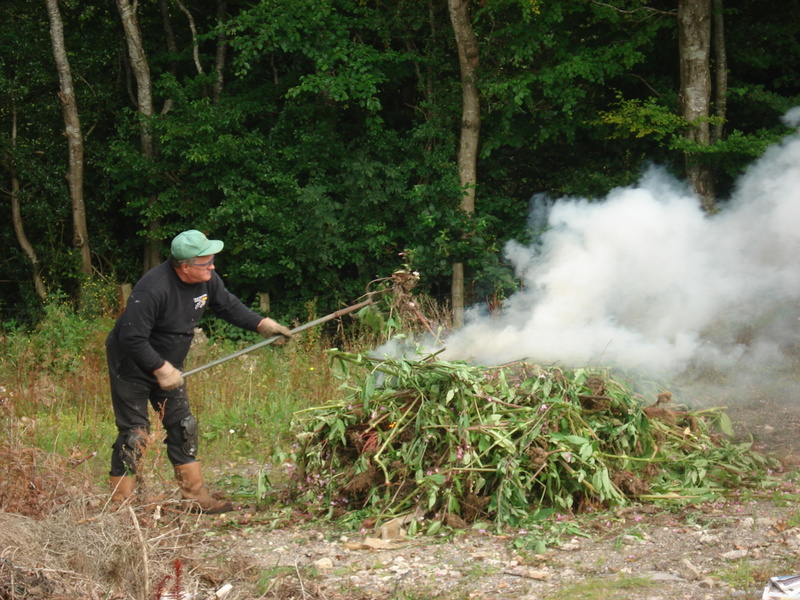 The bonfire smouldered and smoked for over a day, but eventually that was the end of the Himalyan Balsam for another summer. so starts the poem by William Blake about sunflowers. Last year we grew some sunflowers from seed. They were quite successful and produced big heads. When they died down I took the seeds and fed them to the chickens. Unbeknown to us, the chooks didn’t eat them all but left some on the ground. 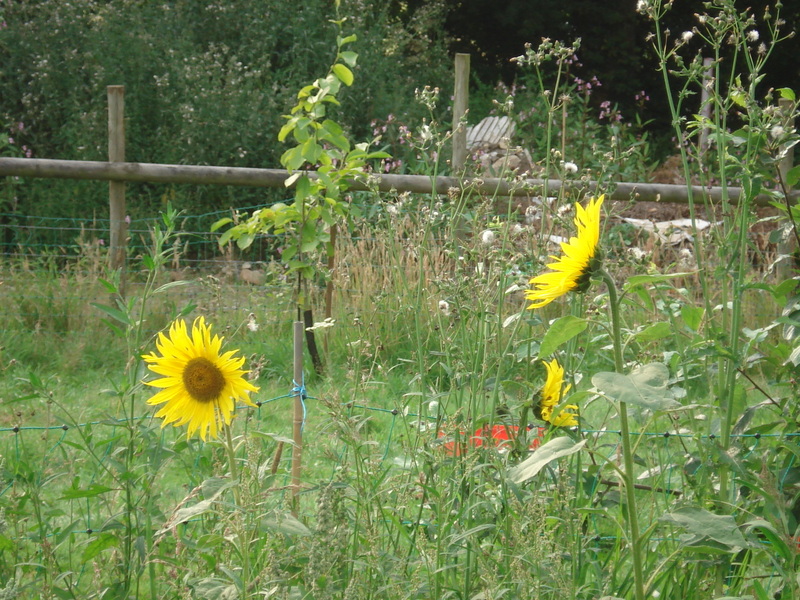 When we moved the chicken run, these seeds were left to germinate all on their own, and this year they have produced lovely flowers amongst all the other wildflowers (weeds!) that have grown up in the paddock where the chickens used to be. What is ironic is that the sunflowers I have grown from seed this year are a pathetic 2 feet tall and nowhere near flowering. 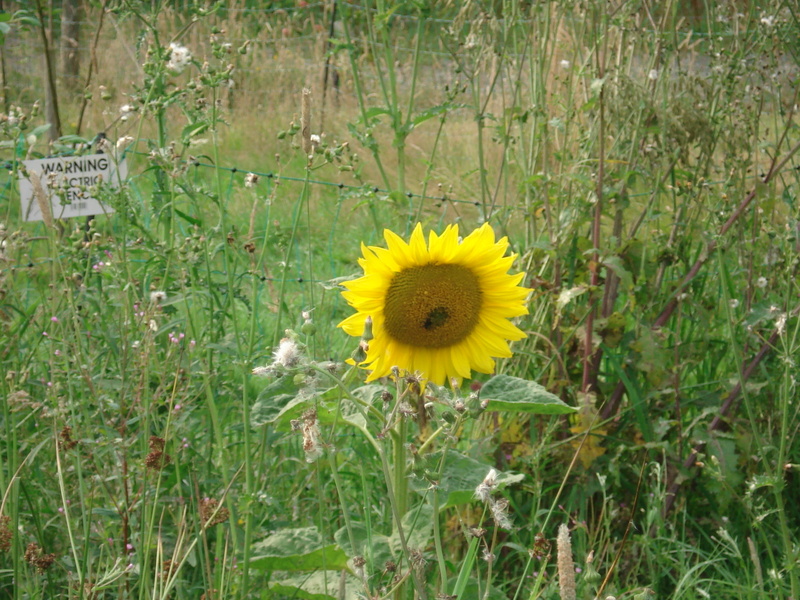 So you know what I am going to do later on this year when these flowers have died back – I am going to sprinkle the seeds all round the wild part of the paddock, and with any luck next year I will have a field of sunflowers! !